Imagine endless beaches of shimmering sand, frothy spray and balmy, tropical weather. Imagine a vibrant kaleidoscope of Portuguese and Coastal Indian cultures, which tinges the local cuisine, language and way of life. Now, imagine Goa. Once a trading post for the Portuguese, who first set foot here in 1510, Goa still retains much of its Portuguese colonial past in its architecture and heritage. Over the years, Goa’s allure has continued to draw visitors from around the world, who now seek out its beaches, its New-Age spirituality and inclusive, laidback way of life. While there are those from whom Goa will always be synonymous with the all-night raves on Anjuna beach and the local flea markets where travellers would sell everything expect the clothes off their backs to extend their stay just a little longer, Goa is actually so much more. The local culture still retains much of the laissez-faire of the state’s Portuguese inhabitants, with siestas considered a daily staple. Goa’s heritage is all-encompassing, as evinced by the Hindu temples that jostle cheek-for-jowl with Catholic churches. Step away from the surf and you will find yourself surrounded by palm groves and rice fields, which are speckled with period mansions and villas. Today, Goa is a holiday Mecca for travellers of varying tastes, interests and lifestyles. The nightlife is energetic, the seafood-dominated cuisine is piquant and delicious, and the local markets teeming with pocket-friendly souvenirs. The best way to explore Goa is on a rented motorbike or scooter, which you can hire for the day at very affordable rates. Popular attractions include the backpacker-friendly Arambol beach, the bustling and very commercial Baga, the palm-laced tranquil sands of Palolem and the vibrant Anjuna. Keep in mind that the South Goan beaches are far less crowded. You can also dabble in a spot of water sports, explore the aquatic life on a scuba diving trip or test your wits on a banana boat! While here, feast your taste buds on Goa’s famous fish curry, bhali-pav or bread roll and curry, the vinegar and garlic-flavoured vindaloo and the spicy Xacuti. Then, treat yourself to a relaxing beach massage or head to a local ashram for a therapeutic yoga session. End your day with an evening of stargazing on the beach as music wafts your way from the small shacks (which also serve excellent food) or at one of Goa’s ritzier nightclubs and fine-dining establishments. Whether you’re an independent backpacker looking for an affordable getaway, a honeymooning couple eager to kindle the spark in your relationship, or a family seeking a quiet holiday away from the mayhem of everyday life, you will find just what you’re looking for in Goa. Browse through our attractively-priced Goa vacation packages, to find a deal that works the best with your budget and preferences. Fulfill your long awaited desires in the land of abundant beaches. 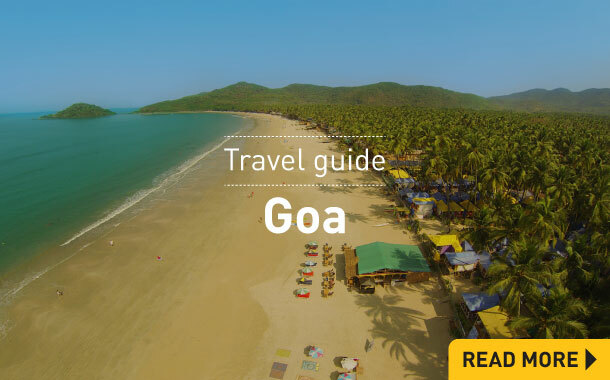 Before you pack your bags for your next great Goan getaway, make sure to spend some time browsing through Musafir.com’s comprehensive Goa travel guide. From the most attractive destinations to the most buzzing shopping districts, we’ve done all the research to ensure you get the most from your holiday. As a coastal state, Goa can get quite hot and humid. The best time to visit is between the months of November and February when, in addition to the pleasant weather, you can also enjoy hobnobbing with tourists, participate in the Xmas and New Year’s celebrations or be a part of Goa’s famous Sunburn music festival. Goa’s pristine, emerald beauty shines through during the monsoon, which hits Goa from June to October. Prices are comparatively cheaper during these months, and you can also participate in the interesting local festival of Sao-Joao, which has men jumping into overflowing wells to retrieve bottles of the local liquor. Goa is a well connected destination. You can travel by road or rail or you can even book an air ticket to Goa. Air: The nearest international airport is in Dabolim, nearly 29 km from Goa’s capital – Panaji. Road: Goa is connected to major cities in Maharastra and Karnataka via the national highways. Mumbai is approximately 610 km away, Pune is at a distance of 460 km and Bangalore is 560 km or 9 hours away. Rail:Goa’s major train stations – Madgaon and Vasco-da-Gama are located in Margao, and are well connected to Mumbai and other major stations across the country. Check out Goa holiday packages online and plan your vacation conveniently and economically.